Can The U.S. Combat Election Interference If Some Don’t Believe It’s Happening? America’s adversaries are circling like coyotes just beyond the light from the campfire, top intelligence officials warn — but that’s not the scariest thing to some members of the Senate intelligence committee. What bothers them is the need to convince people the coyotes are there. “My problem is, I talk to people in Maine who say, ‘the whole thing is a witch hunt and it’s a hoax,’ because that’s what the president told me,” said Sen. Angus King, I-Maine. 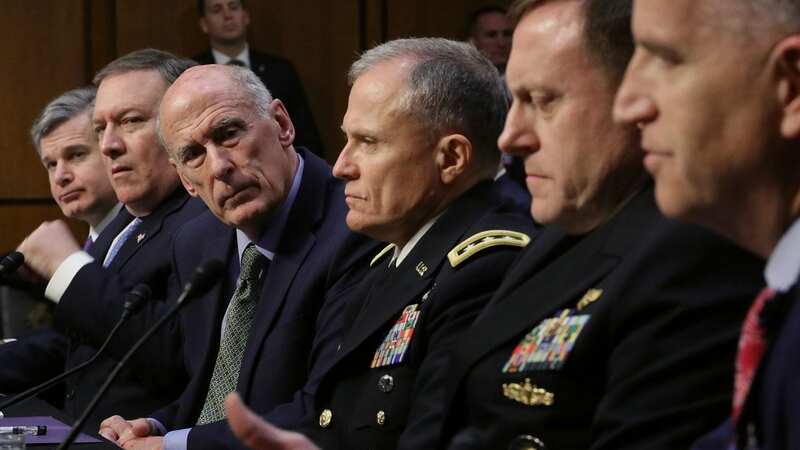 The leaders of the U.S. intelligence community gave bleak evidence on Tuesday about the ongoing threat Russia poses to Western democracies — among many other threats around the world. King contrasted that with the frequent denials and equivocations about Russian interference in the 2016 presidential election by President Trump and the White House, which King said have led to a major disparity in belief around the country. The campaign of “active measures,” as intelligence officers call them, is no longer discussed in terms of whether it happened, but, rather, amid certainty that it never stopped. Director of National Intelligence Dan Coats, CIA Director Mike Pompeo and their colleagues laid out an eye-watering picture about the extent of that campaign. Americans and people across the West, they said, should expect election interference through this year and beyond. “This is not going to change or stop,” said National Security Agency Director Adm. Mike Rogers. Other senators asked Coats, Pompeo, Wray and their counterparts to restate their support for the 2017 assessment that concluded Russia had attacked the previous year’s election. All of them did. Sometimes Trump and the White House accept the dangers the intelligence community says are facing American elections. The administration condemned foreign interference last year when Trump signed a bill mandating new sanctions on Russia as punishment for the 2016 active measures. Other times, Trump or White House press secretary Sarah Huckabee Sanders call the stories about the interference, or its investigation, a hoax perpetuated by sore-loser Democrats. They stridently deny the Trump campaign might have conspired with the Russian attack — and have gone on offense against their own FBI and Justice Department in charging them with bias and abuse of power. Senators and the spy bosses said they worried that the past denials about collusion and the partisan battles have stolen the focus in Washington from what should be the main national effort — deterring interference and defending elections now and in the future. Maine’s other senator, Susan Collins, a Republican, asked Coats about doubts that endure in the country. All right, he was asked — whose job is that? Even so, the intelligence agencies say they aren’t sitting still. Rogers and FBI Director Christopher Wray and said they, for example, are helping to brief state and local elections officials about the potential dangers from cyberattacks. Russian government cyber-intruders got into a number of state systems in 2016 and although no votes were changed nor major major damage done, officials say, that cyber-threat remains potent across the country. Elections systems are also only part of the problem. In 2016, cyberattackers stole millions of emails from political organizations and individuals, including the Democratic National Committee, and then released them to cause embarrassment among the victims. Plus there were other intelligence operations about which much less has become public, including the creation of forged secret documents to try to confuse American officials and, potentially, infiltration of American political groups. Democrats pressed the administration witnesses on Tuesday about why the Trump administration hadn’t done more to punish Russia or deter this kind of interference — why, for example, hadn’t Trump followed up signing last year’s sanctions bill with stronger restrictions now? Pompeo said the sanctions decision had to be viewed in a broader context: The United States is checking and deterring Russia across the globe, he said, from sanctions on Moscow’s ally Venezuela to military action in Syria and beyond. And Republicans said the game this year obviously will be quite different from the one played in 2016, when most people — including inside the administration of President Obama — were blindsided by Russian schemes. “I disagree … that we are no better prepared,” said Sen. Jim Risch, R-Idaho. Not only are the intelligence agencies now on alert, he said, so are voters after months of discussion in Congress and in the press. What about going beyond network upgrades for America’s elections vendors, or educating voters — what about fighting back? Pompeo suggested it was an option but stopped short of saying whether he’d been ordered to exercise it. “We do have some capabilities, offensively, to raise the cost for those who would dare challenge the United States’ elections.” He did not elaborate. American officials, however, have tried to threaten Russia before to stop its interference campaign. None of the witnesses or members of Congress at the hearing on Tuesday voiced much optimism that threats would work now. So the next milestone in the inquiry into Russian election interference — at least in the Senate — could be the release of the intelligence committee’s long-awaited report finally giving the full story about what happened in 2016. Chairman Richard Burr, R-N.C., said he wanted the report to appear before this year’s primaries and to convene another open hearing focusing on the tasks involved with safeguarding elections. Senators say they want to lay a foundation publicly for more work by Congress and in the states because the problem is here to stay.